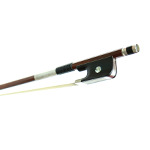 pernambuco stick, Real silver mounted ,Silver bow tip,selected ebony frog with trim slide, Parisian eye,Tree part ebony button with eight inlaid eyes, silver wire winding. 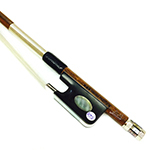 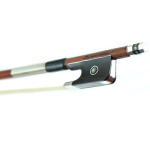 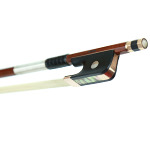 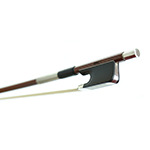 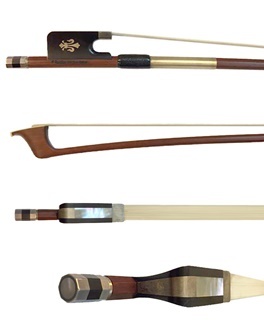 Arguably among the two or three greatest bow makers in history, Peccatte's bows are known for their great strength, tremendous power, warmth of sound and versatility. 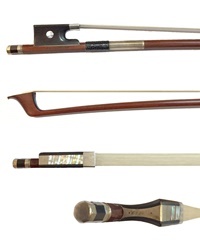 Peccatte was an innovator; heads designed by Peccatte have been called hatchet-shaped and have been copied by generations of bowmakers. 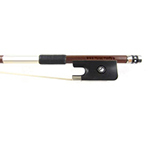 Our Peccatte model, from the Jean Francois Nacovier workshop, is suitable for a strong player who desires layers of sound and powerful projection.